AthletesCAN and Investors Group are pleased to announce that wheelchair basketball national team member David Eng has been awarded a $5,000 Team Investors Group Amateur Athletes Fund bursary. In keeping with their commitment to amateur sport in Canada, Investors Group established a bursary fund for Canada’s top high performance athletes. A national leader in delivering personalized financial solutions to Canadians, Investors Group annually awards twenty $5,000 bursaries to assist Canada’s elite amateur athletes with the costs of training and competition. Selection criteria includes: athletic achievement, financial need and community involvement. Since its inception in 2000, the Team Investors Group Amateur Athletes Fund has provided more than $1,300,000 to Canadian athletes. AthletesCAN administers the bursary on behalf of Investors Group. 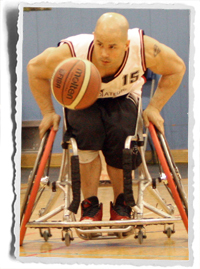 David’s recent sport accomplishments include a gold medal at the 2012 London Paralympic Games. “I feel really honored to be a recipient of this bursary,” says David. “Trying to be a full-time high performance athlete is a challenge of its own. We tend to travel a lot and competition is getting more demanding every single year. The money will help with my training, the everyday cost of living and will free up more time I can put towards hosting a charity game in the near future for my community,” he adds. Investors Group, founded in 1926, is a national leader in delivering personalized financial solutions to Canadians through a network of over 4,600 Consultants located throughout Canada. In addition to an exclusive family of mutual funds and other investment vehicles, Investors Group offers a wide range of insurance, securities, mortgage and other financial services. As the voice of Canadian national team athletes, AthletesCAN ensures an athlete centered sport system by developing athlete leaders who influence sport policy and, as role models, inspire a strong sport culture.